The Spartan Mower has no doubt taken the mowing industry over with its innovative and well-engineered features that make it stand above the competition. Check out the one feature of Spartan Mowers that is second to none. THE RIDE. It’s all about the ride! There is no doubt that there is one feature that stands out from the rest on our mowers, and that is the RIDE of the Spartan. The RT Series (PRO and HD) is packed full of basic features with one being the GT Trac for the best incline traction, precision weight distribution, balance, and control, so you can tackle almost any terrain with confidence. The ride also offers a patented brake system with patent-pending ergonomic foot control which includes lock and unlock capability. Our soft ride rear radial tires offer a very specific tread pattern made just for the Spartan Mower. The tires are designed to ride softer, last longer, improve overall traction, and leave fewer marks in your yard. 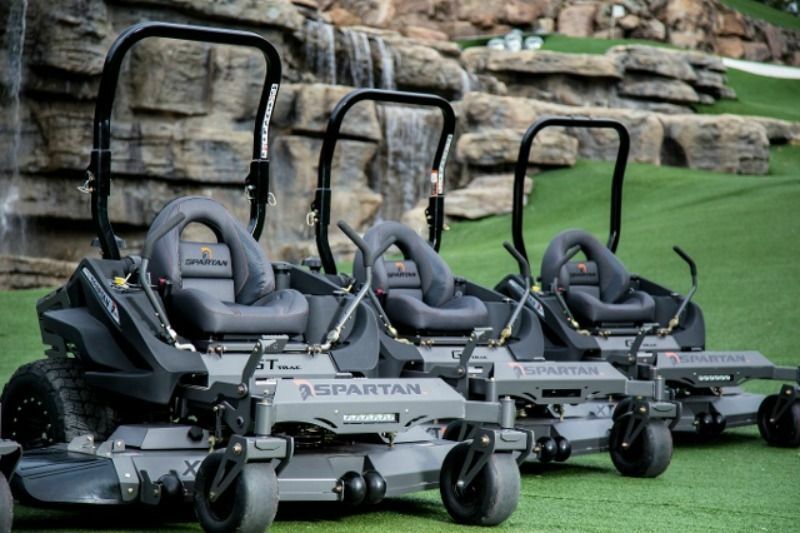 However, if you really want to take your ride to the next level, then check out our Spartan SRT Series mowers (PRO, HD, XD). This series comes equipped with everything the Spartan RT Series packs plus even more! Our SRT Series features Smart Ride Technology. Spartan’s technology utilizes five proprietary components that work seamlessly together to offer you a ride like you’ve never experienced. FRONT: The front of the Spartan is built with an Independent Torsional Axle Fork Assembly with neoprene cushioning for precision turns and superior shock absorption. MIDDLE: The middle of the machine features a weight adjustable seat with Patented TCB-three TecsPak Elastomer shocks because, when it comes to comfort, one size does NOT fit all. REAR: The rear of the Spartan is built with four horizontally mounted Patented Tecspak Elastomer Dampeners providing state of the art travel. SEATS: The seats are adjustable for operator weight, seats can be upgraded and custom-built, and seats have neoprene cushioning to absorb any shock or jostling. TIRES: And like the RT Series, the soft ride tread pattern in the rear radial tires were specifically designed for the Spartan to provide traction without tearing up the lawn. Anyone can jump on a mower and begin cutting the grass, but unless it’s a Spartan, you aren’t getting the smoothest, most comfortable ride on the market. The ride is so smooth, you’ll feel like you are mowing the lawn in your recliner. Go ahead. Take a test drive and experience the difference today. Click here to find a dealer near you. And don’t forget to LIKE our Facebook page to stay updated on the latest news and events with Spartan Mower and to see what others are saying about the new age of mowing!! !